In a time where St. Francis Brooklyn must aim to win as many games possible moving into NEC playoff season, the team would fall into some trouble executing that tonight. With St. Francis (BKN) dominating the first half in leading 41-30 into halftime, the team would ultimately fall apart right at the second half to suffer 84-73 loss to Fairleigh Dickinson. 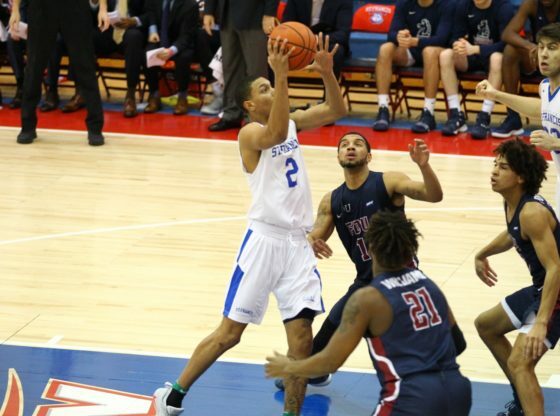 Darnell Edge scored 25 points, Jahlil Jenkins put up 19 points, and Mike Holloway would chip in with 14 points to aid Fairleigh Dickinson into their win over the Terriers. A strong storming Knights team that capitalized off a poor shooting night from the Terriers would shoot 81 percent from 3, while also shooting 69 percent from the field. The Knights would put up a season high 54 points in the second half. The Terriers were solid in the first half, shooting 46 percent from the field and 45 percent from beyond the arc. Though in many games the Terriers have lost, they fell apart in the second half. They shot an abysmal 8.3 percent from beyond the arc and shot 34 percent from the field. The Terriers were also out-rebounded 11-22 in the second half. Chauncey Hawkins had 14 points for the Terriers (14-11, 6-6). Glenn Sanabria added 13 points. Rosel Hurley had 12 points and six rebounds. The Terriers will now look to bounce back against their hometown rivals in LIU-Brooklyn on Thursday at home on February 14.